Construction & Building Materials Dubai, Construction & Building Materials UAE. 25 years of success passed since we started in 1988. Based in Dubai, we got the chance to follow the development of the UAE & the neighboring Gulf countries, allowing us to know very well the needs of the construction sector in the Gulf. 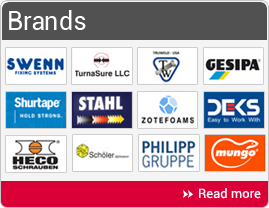 We are a professional trading company, grouping under one roof, a wide range of construction materials, we represent worldwide known manufacturers and cover the Middle-East region. We believe in Quality, and we decided from day one, to distinguish ourselves, by offering only high quality products to the market, knowing that this decision will make it difficult for us to be competitive, but we managed with our selected partners, to provide the market with the best products, and at competitive prices. Our philosophy of quality was the main reason behind the excellent reputation we enjoy today in the market, we are proud of our clean history, with no failures & no complaints, with loyal clients with whom we grew up. March 3rd, 2002 was the date when we were certified by BVQI for the ISO 9001:2000 Quality Management System, which was another achievement for us. This certification helps us ensuring that we follow, at any time, clear procedures that help us achieving our main target: “Our customers’ satisfaction”. On the 2nd of March 2011, we have been re-certified by BVQI for the upgraded ISO 9001:2008 Quality Management System. Our objectives are simple & clear: We want to grow every year, and to do so, we need our partners: “our clients”. A happy & satisfied client is the main key of success. As of today, we have 1675 clients from UAE, Kingdom of Saudi Arabia, Qatar, Bahrain, Kuwait, Sultanate of Oman, Jordan, Lebanon, Egypt, Syria, Iraq, India, Pakistan & Vietnam. We depend on you ! Please depend on us !